Only a couple of hours until the joint exhibition I am hosting with Roberts Birze opens. Thought it might be worth sharing some more thoughts in general on exhibitions. 1. Yes, You Should Hold an Exhibition. No matter if it is putting up some photos in coffee shop with the permission of the owner or managing to talk the NGV to put your stuff up. Holding an exhibition is an important part of any photographer’s artistic development. It makes you think more carefully about what you are doing. Having to curate your images improves your self assessment skills and increases your awareness of what makes a great image next time you get out with your camera. Selling a piece to someone you don’t know (your family will always make at least one “pity purchase!”) is incredibly validating. Someone liked your image enough to swap it for some cold hard cash they spent some of their valuable time earning. Driving towards an exhibition date ensures that you get out and photograph as often as you can to ensure you have a shortlist of images. A pending deadline really can focus your efforts. Even if you don’t sell a single one, just seeing your images up on a wall will be more fun and motivating than you might imagine. 2. Go Hard, Go Early. For the first time ever, I was completely prepared for the Urbanity exhibition this year. My framed prints have were in storage at Hogan Gallery for over two weeks prior to hanging day yesterday. There was no last minute rush, or panic, to get enough bits an pieces to fill the walls. As all dodgy management books say, start with the goal in mind. I started shooting all new images for this exhibition late in 2013. Over the year, I was out shooting almost every weekend. The final count ended up at 163 rolls of 120mm and 35mm film exposed, developed and scanned. Look forward 12 months and step out your deadlines. Based on my math, I shot around 3,000 frames of film to end up with just under 30 images – a 1% hit rate… There were at least a 100 I was happy exhibiting, so maybe the real ratio is more likely 3 or 4%. Best case prediction is maybe 5% of your images will be suitable. Now, how many shots are you going to have to take to get there? The constant cycle of shooting, processing, and curating got me into a sustainable rhythm for the whole 12 months. About 6 weeks out from the exhibition I had a tight shortlist of about 100 images which was finally reduced to 27 images framed and hung in the Gallery. 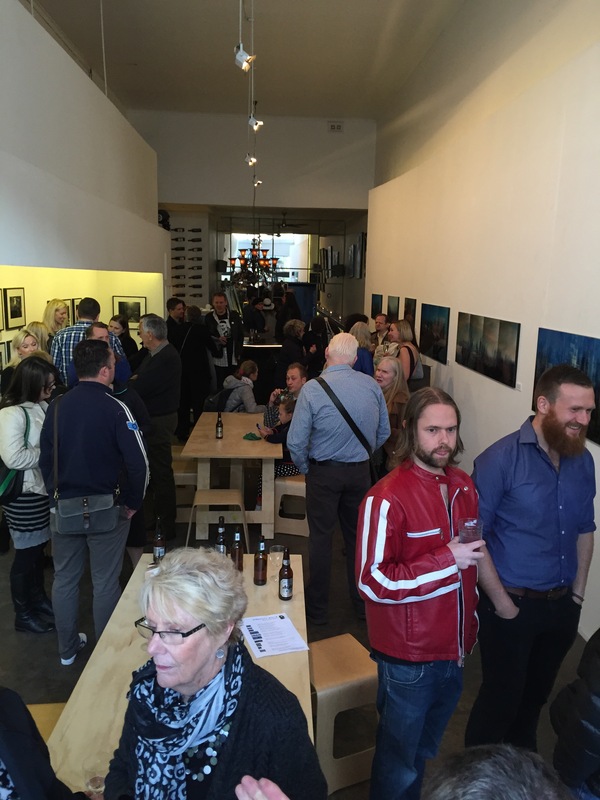 There was no last minute scramble to fill the gallery walls. I was able to ease of the shutter button a bit in the last 8 – 10 weeks and focus on the final curation rather than descending into a blind panic. I am talking co-exhibitors here… For each additional person participating, add one completely different opinion on everything! It is manageable up to about four people, but after that, someone has to call the shots as a benevolent dictator. Partnering with Rob, a long time photo buddy, made it very easy. We both have very different approaches and values, but always seem to be able to make the right compromises together to keep it tight. Having less team mates increases the risks if one decides to pull out without notice. But is more than compensated for by less hassles. After hanging the gallery yesterday, only having two styles up on the walls (one on the north and the other on the south wall) looks super cool. There is no visual conflict as you explore either body of work. 4. Unless it is Your First Time. If you haven’t participated in an exhibition before, I highly recommend horning in on a syndicated exhibition. If you shoot film, this one is perfect. Just pick your best shot, get it framed professionally, and put it up on a wall. This will deliver all the exhibition buzz without the heartache. Very quickly, you will come to terms with the decisions you need to make for larger exhibitions. Do I hang images I like or ones that I know others like? This is a classic dilemma faced by many photographers. I am always suprised by the images that are favourited by others, and disappointed when the ones I love seem to go unnoticed and unappreciated! How do I like my images printed? Printing and framing 27 pieces for the Urbanity Exhibition was not a cheap exercise. I have learnt what I like, and who are good operators in printing and framing over the years by preparing for other exhibitions. For example, one year, I had a lot of black and white shots which the Lab printed using their colour printer instead of a “true” black and white printer. They looked black and white and fantastic, but had a tiny purply cast to them. The lab would not reprint as it was my confusion that led to the issue, and I couldn’t afford to reprint them. Needless to say, all the BW prints for Urbanity were all printed in true black and white! What kind of framing do I like? Black mats? White mats? Mounted to foamcore? and so the list goes on. And on. And on. If you must frame your own prints using an Ikea frame, at least you will learn if you can get a result you are happy with on a single image instead of ending up in tears the day before you open a big solo exhibition! Learning to deal with other “artists”. You will either be surprised how finicky and picky other photographers can be, or you might be the finicky type and have to work out how to deal with more “relaxed” characters. If you can’t work with a particular type, you will work it out in a syndicated exhibition. 5. It Will Cost More Than You Think. Gallery : $2000 for two weeks is a fairly representative rate. This should include having someone “sit” the gallery. You can probably find something cheaper if you are prepared to manage the space for the duration of the exhibition, but remember that means sitting in the gallery every day for the whole day! Prints : I find that a decent print costs around $30 for about 30cm long edge and a good economy professional framing of each print needs an investment of about $50. So each image is going to run you up about $80. There is also the option of mounting to foam board which makes transporting the images easier as they are very light. Opening Night : It is customary to shout the punters who show up a beer or a wine on opening night! Say another $250 – $500 depending on how boozy your crew are! Time : No matter how many exhibitions I participate in, I always forget how much extra work is involved. Setting up facebook invitations, organising prints, picking them up, hanging them, etc. I highly recommend contact Bryan at Hogan Gallery if you are considering holding an exhibition. Bryan can frame your prints, sits the gallery, and has a great little bar. The gallery gets a lot of passing traffic as well. You can read more about selecting images for an exhibition here. Urbanity Opens Tonight! Hogan Gallery….